You will likely be stumped by a puppy behavior or dog behavior question at some point in your pooch's life. This is true whether you're the owner of the dog in question, or the neighbor! These problems will range from something as harmless as a goofy "quirk" like licking the air when you scratch his back to something as dangerous as aggression. Most (if not all) dog behaviors have a solution... the trick is finding it! And that's exactly what we hope to help you with. Find the underlying cause to the behavior, and PRESTO! You're half way there to fixing the problem. Many dogs wind up at the SPCA or in the classified ads because of an owner who, at their wit's end, doesn't know what else to do with him. It really does take serious commitment to have a dog as well as time invested in turning him into the "perfect" pooch you've always wanted. Let me just say that often, you are the problem. Gasp! That's right - I just heard your jaw hit the computer desk. You're probably thinking... the nerve! How in the world can she say that? Don't get me wrong. You love your dog to bits, and would never do anything like that. But let me ask you - have you ever petted your dog when he put his paws on you at the front door to say hello? Well, you've inadvertently praised him for jumping! While you don't mean to teach him improper behaviors, it happens frequently. And I really can't blame you for this. As a dog owner, you simply didn't know. Ahhh... but now the blindfold comes off, because our goal is to demystify dog behavior questions. Nuisance barking - the dog is bored, either inside or outside, or simply wants attention. Digging - whether you have a Houdini on your hands or your dog just seems to take great pleasure in turning up the new sod in your yard, digging can be a very annoying behavior! Stealing objects - some dogs like stealing shoes, while others enjoy having you chase them through the house after your underwear. My dog, Justice, used to prefer finding Kleenex's in the garbage. Chewing inappropriate objects - shoes, purses, pens, kid's toys, clothing, couches, drywall, you name it. Yes, I have seriously heard of people's dogs eating the leather couch! Mouthing and nipping your hands or clothing - while this might start out as just a little annoying, it can quickly get too rough or even escalate into a bite. Peeing or pooping in the house - pee pads? 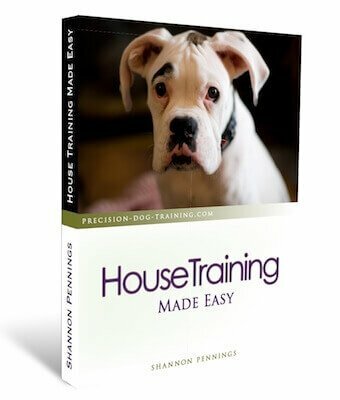 Tell me you're kidding... let me show you the real way to house train your dog! 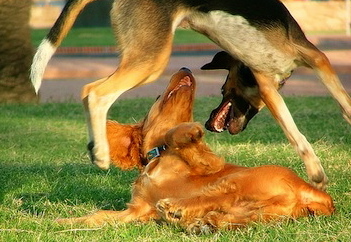 Jumping on you or your guests - find how you are likely the one who is inadvertently teaching your dog to jump. Food and/or toy aggression - being possessive of what the dog thinks are "his". Problems usually arise during feeding time or when playing. Keep in mind - when faced with an aggression issue, you should always seek the advice and hands-on help of a certified professional in your area. We can't solve aggression online for you. 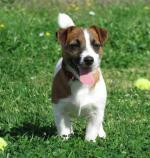 You will need to hire a professional for one-on-one work with you and your dog.